Roxhill Castle Park Needs volunteers from November 2nd through November 6th. This is a 100% community built project and they need volunteers to make it happen. Please visit their website roxhillcastle.wordpress.com and read about what they’re doing. Follow the link to sign up for a work day/shift. Please tell your neighbors, tell your work place, tell your faith community & tell your favorite businesses. They need food/drink donations for volunteers, as well as more wonderful volunteers! 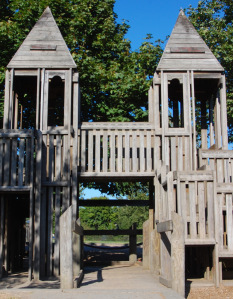 The Roxhill Park playground, known to many as the Roxhill Castle was built by the community back in 1994. It is a unique and iconic park, and very important to the children of the Westwood and Roxhill neighborhoods of West Seattle. It is a unique playground and natural bog & trail area in a historically underserved community. The play structure is now end of life and has been demolished. The Seattle Parks department agreed to rebuild the park in the same fashion and style, using the same contractor. In return, the community pledged to provide the labor. The new park will now also be ADA accessible!